(Novinite) - An exclusive interview of Novinite.com (Sofia News Agency) with His All Holiness Ecumenical Patriarch of Constantinople Bartholomew I. This interview comes days after His All Holiness paid a visit to Bulgaria for the opening of new churches in the Burgas region where he was welcomed by the Bulgarian Orthodox Church and Bulgarian Prime Minister Boyko Borisov. 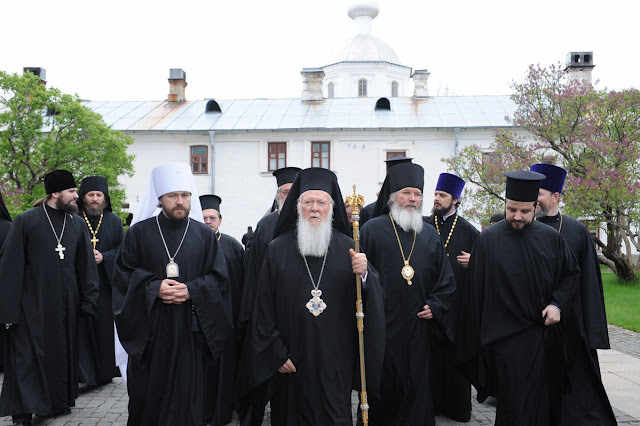 Shortly after that, on May 24, 2010, Ecumenical Patriarch Bartholomew was in Moscow where he performed a service together with Russian Patriarch Kirill on the occasion of the Day of St. Cyril and St. Methodius, the authors of the Slavic script. What would you say are the major, basic characteristics that continue to distinguish today Eastern/Greek Orthodox Christianity from the other Christian churches? It is sometimes best to discern similarities and common ground, rather than differences and distinctive features among Christian Churches. There is often more that unites us than separates us, and we should not be complacent in a defensive presence of Orthodox Christianity in the world. Nevertheless, the Orthodox Church has a profound wealth in its spiritual tradition, which retains a more cosmic, liturgical and mystical world view. This is why current issues of global concern, such as the ecological crisis, are of utmost importance to us inasmuch as they underline how doctrine and ethos are integrally related. The way we worship and pray to God reflects the way we lead our lives and treat our planet. What is the most unique thing about the tradition of Eastern/Greek Orthodox Christianity? What should members of the other Christian churches or other religions know about it? The Orthodox Church is often seen as a traditional Church. And, while it is true that we preserve many elements from the early Apostolic community, which witnessed the Resurrection of our Lord and the Pentecost of the Church, we are also a Church that seeks to dialogue with the present. There is a widespread impression that Western churches are generally more pro-active with respect to social causes and initiatives. What is the main attraction and the main message of the Eastern Orthodox Church in the 21st century, the rapidly changing time of the Global Age? In many ways, there is truth in that widespread impression, and it would be helpful for us as Orthodox Christians to be prepared also to learn from our Western brothers and sisters. As we observed earlier, it is more helpful and beneficial for us to work together in a spirit of healthy ecumenism, rather than work in an isolation that resembles a closed ghetto-like community. From as early as the third century, the West emphasized the role of the Church in the present world, excelling in law, ethics, and the worldly institution. By contrast, the East stressed the heavenly (or eschatological) dimension of the Church, presenting unparalleled models and examples of mysticism and spirituality. So both East and West can learn from one another. The Orthodox Church can reveal how the Holy Spirit and the Divine Liturgy are able to inspire all aspects of the earthly Church – including the organizational leadership of the Church and the social standards of the people. Is it correct to say that the Orthodox Christian religion is a key trait of a Greco-Slavic Civilization, as it is often described by western scholars? While it is true that Orthodox Christianity was the cradle of civilization on the Eastern world – both Greek and Slavic – the unfortunate truth is that the Western world has neglected its Byzantine roots. It is a sad reality that Western historians have been dominated by the importance and influence of the Renaissance, while overlooking the fact that Constantine the Great moved the capital of the Empire to New Rome, Constantinople, in 330AD as well as the fact that all seven Ecumenical Councils of undivided Christianity were held not in Greece or Rome, but in the East, in what is now Turkey. Nevertheless, more recent scholarship has embraced a more comprehensive view of history. As shown in Dr. Runciman’s great books, the memory preserved by the Mother Church of Constantinople through the centuries was the memory of an Orthodox ecumenical civilization. However, it is not easy to turn around a tide of historical prejudice. Greeks and Bulgarians used to have more powerful medieval empires, which boosted Orthodox Christianity. What is the role of these two nations today as far as Orthodox Christianity is concerned? Is it fair to say that Russia is the leading Orthodox nation nowadays? We should remember that the situation of the first millennium no longer prevails in our world, and we should not live in such a manner that reflects those circumstances. Moreover, while the original system of Pentarchy emanated from respect for the apostolicity and particularity of the traditions of these ancient Patriarchates, the autocephaly of later Churches grew out of respect for the cultural identity of nations. Thus, today, we have reached the perception that Orthodoxy comprises a federation of national Churches, frequently attributing priority to national interests in their relationship with one another. Yet, secular forces have never been the primary focus or foremost definition of Orthodox ecclesiology. Our criteria of ecclesial identity and unity are not the measures of this world – of numbers and wealth – but derive instead from the Holy Spirit, as this is revealed in the Church Councils and the Holy Eucharist. We do not, as during Byzantine times, have at our disposal a state factor that guaranteed – and sometimes even imposed – our unity. Nor does our ecclesiology permit any centralized authority that is able to impose unity from above. Our unity depends on our ecclesial conscience. The sense of need and duty that we constitute a single canonical structure and body, one Church, is sufficient to guarantee our unity, without any external intervention. This is precisely why we have to date convened five meetings (Synaxes) of Heads of Orthodox Churches throughout the world, while we have at the same time insisted on advancing preparations for the Holy and Great Council of our Orthodox Church. We have been blessed with a recent official visit to Russia at the invitation of His Beatitude Patriarch Kirill of Moscow and we have, therefore, witnessed the vital rejuvenation as well as the complicated adversities of the Russian nation. From your position as the Ecumenical Patriarch of Constantinople you have sought to promote peace among Christians, Muslims and Jews. What are some of your successful initiatives in that respect? In an age of rising sectarian violence, what can religious figures of your rank do to help bring about peace and understanding? In addition to the bilateral academic dialogues that we hold on a regular basis with both Jews and Muslims (since the early 1970s), the initiatives that we have promoted in recent years include: the Peace and Tolerance Conference (Istanbul, 1994); the Conference on Peaceful Coexistence between Judaism, Christianity, and Islam (Brussels, 2001); the Conference on Religion, Peace and the Olympic Ideal (Athens, 2004); and the second Peace and Tolerance Conference (Istanbul, 2005). These gatherings, and others like them, have proved both pioneering in purpose and historical in substance. For they opened our eyes to the diversity of cultures and religions that comprise our fragmented global world. It is our firm conviction that all religious leaders can benefit from such meetings inasmuch as they widened people’s appreciation of racism and fundamentalism, while assisting in distinguishing between religious tolerance and religious absolutism.